Hunter Lee might have been the least likely player to lead Elizabethton’s assault of Johnson City’s pitching staff Tuesday night. He entered the game with zero hits in 16 professional at-bats, he was batting ninth in the order, and his third-inning single brought mock cheers from his own dugout. 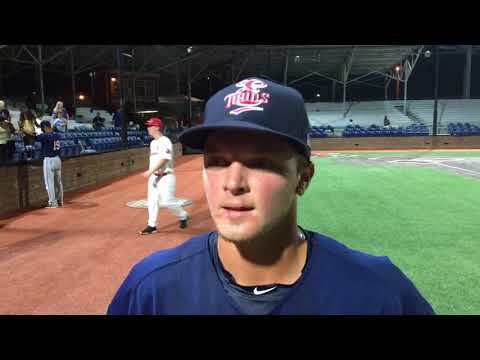 By game’s end, the good-natured fun was over and Lee had finally arrived with a four-hit performance that sparked the Twins to a 15-1 blowout of the Cardinals in an Appalachian League baseball game at TVA Credit Union Ballpark. Elizabethton improved to 11-8 as it kept pace with Kingsport in the chase for first place in the West Division. Johnson City fell to 9-10. It’s hard to raise a batting average 200 points in one game, but that’s what Lee did with four straight hits. He also cranked a sixth-inning home run. Lee said the coaching staff helped him make a couple of adjustments with his swing. He went from triple-zero to .200 in a seasonal blink of an eye — before a ninth-inning strikeout dropped his average to .190. Even the strikeout was loud as Lee was rung up by the field ump when it was ruled he didn’t check his swing on a ball that nearly hit him. A 2-1 contest, set in place for the Twins by Ryan Jeffers’ first-inning two-run homer, quickly exploded into a blowout. Elizabethton scored seven times in the fifth inning, three in the sixth, and added three more in the seventh. It was 15-1, and two of the Cardinals’ relief pitchers had combined for 2 2/3 innings with a staggering 13 hits and 13 earned runs. Michael Davis and Alex Robles each totaled two hits and three RBIs, Andrew Cosgrove had three hits and two RBIs while Jeffers and Albie Weiss each had two hits and two RBIs. Lean Marrero added two hits and scored three runs. Pedro Garcia had an effective start, but didn’t qualify for the win. He worked four innings, allowing two hits and one unearned run. He walked three and struck out one. Blair Lakso worked three shutout innings, and Seth Pinkerton finished the deal. Michael Perry and Moises Castillo each had two hits. The teams will meet again Wednesday with a 7 p.m. start time.